In this special, dangerous moment in which the world, Europe and Poland have found themselves and for balancing the martyrological position of a victim, in which – with short intervals – we remain from 1939, we today need a thrilling legend of a wonderful hero, leader, in which he – as once Jan III Sobieski – leading mighty, armoured troups crumbling enemy armies, defended our freedom and the one of allied countries. Few years after the death of Marshall Józef Piłsudski, hero of the regained independence, our nation witnessed its own horrible failure, with which material and mental results we face constantly for tens of years and in which atmosphere of which next generations are brought up. In the last decade, when it was thought that after Solidarity surge of the whole society, which in consequence, in a peaceful manner, has changed the face of entire Europe, we would finally be able to enjoy full freedom, it turned out to be possible, but not entirely. A day before the centenary of regaining independence by Poland, from countries located in the northern part of the continent – from France, Belgium, and from Germany, started pouring in reprimands and threats. Allegations of supposed democracy rule breaking and building a system pillaring on fascist organizations, are raised by EU politicians who come precisely from these countries, which owe to Poland liberation from German and their native fascists. Freedom and chance of building a democratic system, according to their own, independent rights, to millions of French, Belgians and Dutchmen, and in certain sense also Germans, were brought with a sacrifice of their own blood and life by soldiers of the 1stArmoured Division of gen. Stanisław Maczek. Testimony to this truth, which Brussels, Paris or Berlin „defenders of European values” seem to not know, every year give inhabitants of more than 100 towns and villages of Normandy, Brabant, Flanders and the Netherlands, placing wreaths and flowers on the erected by themselves monuments to honor Polish liberators and marching in solemn processions along the streets bearing names of Polish soldiers. In the struggles of the last war no other Pole has achieved so many and such spectacular victories over Germans as general Stanisław Maczek, in the lead of formed by himself, disposing of the most hi-tech and most powerful armament – the 1st Armoured Division of the Polish Armed Forces in the West. 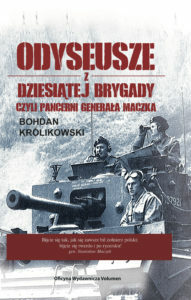 Just as some time before Americans initiated the legend of Tadeusz Kościuszko, so after the World War II „simple folk” – French, Belgian and Dutch – begun to create the legend of general Stanisław Maczek – Chief Commander of the Armoured Division of the II Republic of Poland, and of his soldiers. Current and urgent task-challenge for us, Poles, is not only to maintain this legend, but also build it – on a European scale, and place the flawless person of the General on a pedestal of a national hero. The aim of the program „Liberation Route of the 1stArmoured Division of gen. Maczek” is the realization of this challenge. The inauguration of the prepared since 2016 long-lasting program „Liberation Route of the 1st Armoured Division of gen. Maczek” took place on the 6th of September 2017 in the Canadian-Polish Museum in Adegem, in presence of m. in. minister Anna Anders – Honorary Patron of the Program. We will build this legend through realization and coordination of many various but interconnected thematically and chronologically projects; their authors and executors will be individuals, organizations and institutions, in Poland and abroad, young and older, active locally and managing entities centrally or on a corporative level. Previous PostPrevious Merry Christmas and a Happy New Year 2018!